We’d love your help. Let us know what’s wrong with this preview of Running in Heels by Mary A. Pérez. Somewhere between st Readers who praised this story of coming of age -- and coming into grace -- will love this new book club edition! Running in Heels is an autobiography of the grit and grace that carried a young girl through the shadows of her mother's choices and on through an abusive marriage. Mary A. PErez narrates an incredible story of survival in the face of hopelessness, and learning to forgive against all odds. To ask other readers questions about Running in Heels, please sign up. Running In Heels is not good because the reader will learn all the juicy tidbits they’ve come to expect from a celebrity autobiography. It’s not good because her story is unique or made national headlines and is in any way familiar to us. It’s good because (but for the grace of God) it could have been anyone’s story. It’s relateable. It’s emotional. It’s raw. And today, it’s something that happens far too often. Mary takes us on a journey that begins with her early childhood and ends with present Running In Heels is not good because the reader will learn all the juicy tidbits they’ve come to expect from a celebrity autobiography. It’s not good because her story is unique or made national headlines and is in any way familiar to us. It’s good because (but for the grace of God) it could have been anyone’s story. It’s relateable. It’s emotional. It’s raw. And today, it’s something that happens far too often. Mary takes us on a journey that begins with her early childhood and ends with present day, hitting all of the life-changing elements without adding the unnecessary tidbits that would bore a reader. In a candid delivery she shares what it’s like to grow up without food. What it’s like to grow up too fast. What it’s like to love and dislike a person at the same time. We feel her loss, we share her pain, and we root for her to rise above. Told in first person, Mary recounts many of the most emotional, painful stories of her life. She calls out others (including family members) on their part in her pain, but she also shares her own faults and mistakes. She credits those who made her life sane. Mary shows us how to love someone who is less-than-worthy, how to look past a person’s flaws to find their heart, and how to forgive those who have caused the most pain. She teaches us that even though you may be a damaged soul, there is life and light if you allow God to lead the way. This is not a religious book per say, although Mary’s faith is evident once she decides to follow. She shares many heart-breaking stories, but I think it was her happy ending that stirred the most emotion for me. There were a few slow spots, but there wasn’t one that took away from the read. Before I reached the point where I wanted to start skimming, the pace picked up and the story continued to move along at a steady tick. A variety of experiences led to a range of emotions while reading Running in Heels by Mary A. Perez. As I read Mary's story I felt the time and culture in which she grew up. I felt the neglect and the love that was the thread of her life. Memoirs and biographies are not the books I usually read but this book held my attention from the first page to the last. I will watch to see if any of these characters get a book of their own or will she move to fiction. This book is incredible in every sense of the word! I cannot recommend it highly enough. It is the memoir of a girl who, by the grace of God, lived to tell the story. The story is one of hope. A hope that clings to a God Who deals in the ordinary, and uses the ordinary for His glory. Personally I enjoyed the Puerto Rican heritage, blended with NY and Miami. There were many pieces of the story with which I identified, partially because I grew up in the same era, albeit in different circumstances. This book is incredible in every sense of the word! I cannot recommend it highly enough. It is the memoir of a girl who, by the grace of God, lived to tell the story. The story is one of hope. A hope that clings to a God Who deals in the ordinary, and uses the ordinary for His glory. Personally I enjoyed the Puerto Rican heritage, blended with NY and Miami. There were many pieces of the story with which I identified, partially because I grew up in the same era, albeit in different circumstances. I love the many period identifiers in the author's childhood. If you were raised in an intact and safe family, you may have difficulty believing this memoir. At one point I thought this reads like unbelievable fiction, though I don't believe any of it was made up or written for effect. It is incredible to me that children who are neglected and abused can not only survive, but lead productive adult lives - by the grace of our loving God. This book touched my heart in so many ways, some because I could identify with the author, and some which were convicting to me. The best part of the book (no spoilers) is the relationship between the author and her mother. Regardless of the reader's circumstances this will speak to your heart as well. I give this book a 5-star rating for a couple of reasons. One, the author is not a writer by trade, yet this book is very well written. I believe she worked very hard to make it so. And two, because it reached way down to my toes - it 'got me' where it matters. I absolutely love the transparency of the author. She claims to serve a perfect God, while she continues to be human. This is not a preachy book, but rather as down-to-earth as can be, giving credit to God and His grace. I received my copy of Running in Heels: A Memoir of Grit and Grace by Mary A. Perez from the author in exchange for my honest review. Opinions are my own. Thank you so much, Mary, for asking me to review your book. The blessing is all mine! This book was hard for me to read, mainly because – post motherhood – I have discovered that reading about terrible childhoods pulls at all the wrong heartstrings. Getting through the beginning and wanting to scoop little Mary away from all the mess, while simultaneously wanting to save her mother from herself, was stressful. The things I loved about The Glass Castle are the same things that, after having a daughter, held me back from finishing The Liar’s Club. Things I have the stomach to deal This book was hard for me to read, mainly because – post motherhood – I have discovered that reading about terrible childhoods pulls at all the wrong heartstrings. Getting through the beginning and wanting to scoop little Mary away from all the mess, while simultaneously wanting to save her mother from herself, was stressful. The things I loved about The Glass Castle are the same things that, after having a daughter, held me back from finishing The Liar’s Club. Things I have the stomach to deal with in real life, because it needs done, is not something I have the stomach for in past tense memoirs, because what is done is over with now. This author had the ability to keep me reading from beginning to end in one day. I would rank her up there with Janet Evanovich, Mary Higgins Clark who also have that ability.She has a wonderful career ahead. I cannot wait for her next book.The struggles she had as a child seem to have made her a very strong and caring person. Running in Heels: A Memoir of Grit and Grace is a poignant, moving read that made me feel a lot of host of different emotions. This moving piece of non-fiction may be hard-hitting at times, but it is an essential read because it will make the reader aware, and shed light on a subject and happenings that not too many people think about. That is why already I have to implore you lovely readers to read this moving memoir; it is beautiful, heart-breaking and touching all at the same time, and you wi Running in Heels: A Memoir of Grit and Grace is a poignant, moving read that made me feel a lot of host of different emotions. This moving piece of non-fiction may be hard-hitting at times, but it is an essential read because it will make the reader aware, and shed light on a subject and happenings that not too many people think about. That is why already I have to implore you lovely readers to read this moving memoir; it is beautiful, heart-breaking and touching all at the same time, and you will not be disappointed if you read it. Running in Heels is written by the lovely Mary A. Perez. Perez takes the reader on the journey of her life, starting from her childhood to her adulthood. Perez begins her tale with her youth; she describes how she was raised with an abusive alcoholic, who so happens to be her mother and how her father was absent. Perez always longed for more so when she meets the man of her dreams, she marries him and thinks their lives will be perfect after that. However soon cracks start to appear in her husband, and she soon realizes that he is not prince charming after all and in fact, he is hell itself. Perez is brave in her story-telling, she talks about the painful, unpleasant periods of her life candidly and honestly but she also takes the reader on her journey of finding love and happiness. I have read many memoirs but never have I read one that is so moving and candid, so I applaud Perez for sharing her story with us readers. Perez has written her story in a way which speaks to the reader. At the core of her story is the tone of refusing to be a victim and that there is hope, even after a traumatic period. Her inspiring words and lessons laced throughout have made me want to be a better human being… I love when a memoir makes me feel this way. I love feeling inspired and wanting to be a better human, so again, I applaud Perez for her talent to reach me, and hopefully the rest of her readers to feel this way. Perez is a fantastic writer, and I was impressed by the high quality of her words, she has poured her heart and soul into her book, and has been so open. I admire her for this and her message of hope which is prominent throughout her book. Perez is a good human being… the world may be full of terrible people but if there are more people like Perez then the world would be ok.
Running in Heels is a gut wrenching memoir from an extremely talented author. Mary was dealt a seriously bad hand of misfortune after mistreatment after tragedy and still, in the end with a hell of a lot of learning, searching and growing up, she came out of horrible circumstances to create a better, healthier life for herself and those around her. But lets backtrack for a minute and talk about the cover. That stunning, heartbreaking yet beautiful cover. It tells its own story. I see a lost little girl playing at being mummy, whose just as lost. Growing up with a neglectful mother prone to abusive partners and between house after home, mother to grandparents to father and back again would leave a mark on anyone, especially a child and it is no wonder Mary acts and speaks years beyond her age with forced maturity within this memoir. The voice throughout the book bleeds childlike innocence in the beginning and then as Mary starts to understand that things aren’t right the voice matures and develops with her while still keeping the tone of a child. Even though it is written in the past tense coming from years after the fact with the benefit of adult sensibility and hindsight Mary’s voice, as a child, is startling present. As the life events progress through the years so too does Mary’s voice. Events of abuse told from a very young child’s viewpoint in not fully grasping the terror in front of her but merely cataloging interactions. The resentful rebelliousness of a child barely teetering on the edge of calling herself a teen. The resigned to her fate of a too young mum in a violent and volatile relationship, with another one along the way (cross your fingers for a boy). All the while the strong reflective, strangely forgiving and omniscient voice of the author, real life Mary, comes through as a subtle and highly effective undertone to the book. Running in Heels jumps from one anecdotal incident to another, opening with Mary’s mother and then boyfriend stealing Mary and her older brother from daycare. This style of writing still manages to maintain a semi-fluid pace that doesn’t jar the reader from the path the author is creating between memories. I think it gives the memoir real substance because it is essentially one massive compilation of events which progress as the years go on, as Mary ages and is forced to mature and confront adult situations, like being pregnant in her early teen years. The events retold in this book are devastating. You want to reach into the pages and pluck little Mary out and take her home and just love her. You want to keep reading. You want to read to the end to see what becomes of Mary and to find out who the person she has become at the end of the memoir, once shes on the other side of these terrible life circumstances. I believe it’s the really compelling books, novels, memoirs, autobiographies that make you want. I personally have no idea of what it would be like to not only live through these experiences, but to relive them, write them down so they’re all in the one place and share them with the world. It wasn’t a laugh out loud book or a life is good kind of book. It was inspiring towards the end but the bones of the story weren’t something that left you comforted or even particularly hopeful. Disclaimer: I received this book through the Goodreads Giveaways program, though as usual that has no effect on my opinions or review. I entered the giveaway for this book expecting something totally different. From the title, I thought it would be a fashion industry memoir in the vein of The Devil Wears Prada. When I received the book, the cover and description made me wonder if there was going to be a human trafficking story somewhere in there. In my opinion, the book could use better promotion Disclaimer: I received this book through the Goodreads Giveaways program, though as usual that has no effect on my opinions or review. I entered the giveaway for this book expecting something totally different. From the title, I thought it would be a fashion industry memoir in the vein of The Devil Wears Prada. When I received the book, the cover and description made me wonder if there was going to be a human trafficking story somewhere in there. In my opinion, the book could use better promotion and marketing, but I digress. This is probably the most heartbreaking book I've read so far this year. Perez's journey throughout her unstable childhood, her love for her grandparents, the neglect she suffered under her mother's care, the abuse she suffered at the hands of her alcoholic first husband, and the eventual redemption she found to turn her life around are remarkable. Prose-wise this book is nothing hugely unique or lyrical, but Perez is a competent writer that manages to convey her feelings as a child, teen, and adult as if she really were writing it as a child/teen/adult. I felt an unbearable rage as Perez described the difficulties of trying to raise her baby sister and parent her own mother. If you've ever wondered how abuse and childhood neglect can cause a cycle of abuse, this book is pretty much the best example. Despite the love she received from her grandparents, Perez still suffered from lack of structure due to her mother's wild ways. And yet Perez also writes sympathetically of her mother, noting that although her mother received love and guidance from Perez's grandparents, she still had feelings of awkwardness and perhaps undiagnosed learning disorders or mental issues that ended up having her seek validation from one alcoholic boyfriend to the next. I often wonder how children in this situation break out of the cycle of abuse. Abstractly, I've seen it happen in my own family, and I know it happens to others. I've been so lucky to have loving parents and an amazing sister, and it makes me so heartbroken to know that other people did not have the luck to be born into families such as my own. One passage that made me break down crying was when an 8 year old Perez and her younger sister Anna were taken into custody by the police after their mother and stepfather didn't bother to feed them or provide baby Anna with diapers. The girls were brought to a children's hospital, where Perez noted how warm the bath was, and how it was the first time she had clean and warm pajamas. Imagine, a world where a child has never had clean clothes because her family never bothered to wash them. Perez also had an impressively bad haircut due to the nurse cutting out the knots in her hair, because Perez's mother never bothered to comb her hair. I am ambivalent about having kids of my own, but one thing I do know: no child should ever suffer neglect like that. One thing I would have liked to see a little more of was the development of Mary's relationship with her husband, and how they found God together. That part was a little rushed, which is why I took off the fifth star. For those who grew up in a loving and stable environs, it is difficult to image what home life would be like if it were filled with drunkenness, shouting matches, and abuse. Yet the latter description captures only a portion of Perez's dysfunctional past. Written in three parts, Mary Perez's memoir delves into the spiritual healing of one woman who was once caught in the vicious cycle of codependency. The first section centers on Perez's childhood and early teen years. At the tender age of three, For those who grew up in a loving and stable environs, it is difficult to image what home life would be like if it were filled with drunkenness, shouting matches, and abuse. Yet the latter description captures only a portion of Perez's dysfunctional past. Written in three parts, Mary Perez's memoir delves into the spiritual healing of one woman who was once caught in the vicious cycle of codependency. The first section centers on Perez's childhood and early teen years. At the tender age of three, Perez goes to live with her mom after her parents divorce. Her mom's life spirals out of control with the addition of alcoholic, abusive boyfriends, and plenty of partying. Mary is frequently left at home at night and has to fend for herself. Many moves and four years later, Perez's mom surprises her with a baby sister; while the newfound companionship is refreshing, Perez now has to take care of herself and her baby sister. Children's Services steps in, her mom is sent to jail, and Perez and her sister move in with their grandparents. Situated in a strong Christian environment for the next three years, Perez is happy to attend school on a regular basis. But her home and school contentment is short lived. With the tragic death of her sister, candid narrative shifts into raw emotion as Perez slowly succumbs to withdrawal in her preteens, and by age twelve she takes an emotional nosedive. Juvenile detention, drugs, alcohol, abusive boyfriends, scores of unstable living arrangements, and finally dropping out school mark Perez's new life. At the age of seventeen, Perez enters into a fourteen-year relationship with a man sixteen years her senior, and gives birth to four children over the next five years. In Part Two, Perez says clearly that her life with this domineering man—riddled with a troubled past and alcoholism—was nothing less then tumultuous, especially when he abandons her and the children. Yet in a miraculous turn of events six months after their divorce, another man comes into Perez's life, and this time he's a keeper. While Part Three zeroes in on this marvelous transition, Perez points out that she would not be where she is today if it were not for God's intervention in her life over the years and her grandparent's faith that sparked her interest in Christianity. Very moving and highly inspirational, Running in Heels, as Perez clearly states, "is more than a memoir. This is a promise of hope and survival to anyone who woke up hungry and went to bed hungrier every day, for anyone who was abandoned as a child or an adult, for every wife who has loved a husband who left bruises on her heart and on her body." While the reader applauds Mary’s efforts to rise above the bog she has fallen into, there remains a concern about her marriage to alcoholic Donny. How will it work out? Mary is not only compassionate but a forgiving human being. An unexpected twist toward the end serves to illustrate just how far she takes this. I found the book wordy, overwritten in places, slow in others, and repetitive. (Her mother doesn’t like cooking – said three times and referenced at the end). The book goes on too long in the latter part as if the author didn’t know how to end the book. However, this memoir is valuable reading for any readers who are living/have lived with alcoholics or have/had to deal with the effects of alcoholism on their family. I also recommend it for young women to gain awareness of both the short and the long-term consequences of alcoholism. Memoirs are a great way to get inside a person; to see how they tick, what experiences made them who they are today. I’m not a big memoir fan, but every now and then, I read one that captures my attention. Running in Heels was one of those books. Most who read this book will find some part of it relatable, especially if you came from humble beginnings or if you had or have some type of dysfunction in your family. And let’s face it, we all do. I love Mrs. Perez’s ability to show transparency and share her life with us as readers. There is no holds barred as she tells us about a time of being raised by her grandmother because of her mother’s dysfunction and frivolous lifestyle. She also shares how she viewed life and how and what she learned at various stages of her life. She goes on to talk about her own dysfunction, failed life challenges and failed relationships with her mother men and her children. Mary’s story is one void of a fairytale happy ending as she talks about her struggles, and the use of faith and endurance that got her through and continues to get her through the challenging experiences and how she was blessed with a husband who loves her flaws and all. Remember that this book is a memoir; however, the author’s story telling skills and narrative make this book read like a novel. Mary’s shared story is full of culture and faith. Running in Heels is a compelling memoir that explore the life of author Mary Perez as she experiences tragedy, abuse, extreme loneliness, and ultimately forgiveness. From the moment Mary's parents divorced, and she was sent to live with her mother, her life was set on a downward spiral. Her mother was more interested in drinking and men than in parenting and Mary often went without food and on a few occasions shelter. Her only reprieve was the time spent with her grandparents. A house full of lov Running in Heels is a compelling memoir that explore the life of author Mary Perez as she experiences tragedy, abuse, extreme loneliness, and ultimately forgiveness. From the moment Mary's parents divorced, and she was sent to live with her mother, her life was set on a downward spiral. Her mother was more interested in drinking and men than in parenting and Mary often went without food and on a few occasions shelter. Her only reprieve was the time spent with her grandparents. A house full of love, laughter, and plenty to eat Mary longed to remain with them, but always found herself back with her mother. Due to lack of parenting Mary becomes a delinquent teen and ends up in juvy. Upon her release she finds her "prince charming," or so she believes, but her prince is abusive and possessive. Mary, vows to make the relationship work and believes Donny's empty promises which only lead to several pregnancies and lots of heartache. Will Mary ever escape the cycle and find the peace and love she deserves? The book is written in a style that just tells the story like it happened. There is no fluff or attempt to make it more interest I received this book in exchange for an honest review. The book is written in a style that just tells the story like it happened. There is no fluff or attempt to make it more interesting, just raw, painful, events, one after another, like they happened in life. perhaps the book could have been made more "novel like" for our reading pleasure, but I don't think there is any way to sugar coat a life like Mary endured. This is a great book for book clubs to discuss, much could be learned about how children are affected by their parent's behavior. Perhaps it would be a good read for AA members, it is a sobering reminder! From girlhood to womanhood, Mary narrates this cunning and deeply profound tale of strength and hardship. The reader will see her pain and struggles while taking a seedy tour of America’s history. The story chronicles the life of a girl, transforming from a neglected child to an abused wife. Details were brief and fleeting, yet, I felt that certain areas a lagged a little too much. Generally well-written and soulful, Running in Heels is a raw and colorful piece of art. Although the pace was slightly offsetting, readers will still be amazed by this simple recollection and will be able to relate. I don't like reading, but I could not put this book down. Found myself upset towards the end, because I knew I was near the end of reading it. First of all, it was an easy read. Secondly, I have a much more profound respect for my mother now. Learning more of the stories that were told to us kids (my siblings) in livelier detail. The hardships my mother endured and overcame. Pretty neat how she kept those letters from my great-grandma. And I could actually "hear" all the characters of the book in my mind, especially Grandpa! She captured their voices perfectly and put them in the pages. I won this autographed copy in a giveaway. I don't even know where to begin. Mary's story kept me turning the pages and having to remind myself that this is a TRUE story!!!! My heart wrenched for her as a child struggling to grow up in a less than ideal environment and the envied her in her ability to forgive as an adult. She's made me want to improve on this in my life. What a wonderful and enlightening read. This memoir reveals the story of Mary's painful childhood, her mother too emotionally unhealthy to properly care for her and her siblings, the loss of her beloved sister due to neglect, Mary's marriage to an abusive, older husband and ultimately the awakening in her heart of a Heavenly Father who loved her and had a purpose for her life. It's a story of sorrow, loss, forgiveness, and a life renewed by hope and faith. This book will tear your heart out and then put it back in. The troubles that excessive alcohol use bring to a family can repeat for generations, a cautionary tale. But the grace of God can put families back together and introduce a peace that passes all understanding. A good well-written read. I loved this book because as I read the it I felt like I was sitting on the couch talking to Mary. The book had a natural flow to it and I was done reading way to early in my opinion. I just wanted to know more about Mary. It was such an inspirational story! Childhood is fleeting. And for those of us who grew up with caring parents, we were and are truly blessed. But there are those children who know only a cold touch, hunger and neglect. Such was the childhood of Mary Perez. The one ray of light into Mary’s life was her God-fearing grandparents. This loving couple guided Mary, often from afar, sometimes when by chance when she lived with them. Their precious letters were a Godsend at times and usually right when Mary needed guidance. Seeking love, Childhood is fleeting. And for those of us who grew up with caring parents, we were and are truly blessed. But there are those children who know only a cold touch, hunger and neglect. Such was the childhood of Mary Perez. The one ray of light into Mary’s life was her God-fearing grandparents. This loving couple guided Mary, often from afar, sometimes when by chance when she lived with them. Their precious letters were a Godsend at times and usually right when Mary needed guidance. Seeking love, Mary had barely grown into womanhood when she fell in love with a man she hoped would be her Knight in Shining Armor. But physical and mental abuse became commonplace, usually after a night of heavy drink. Mary grew depressed at times. And when the babies began to arrive, little changed in her circumstances. But still, she turned to God. And with God came hope for change. RUNNING IN HEELS by Mary A. Perez is a poignant read, well written and honest. Journeying through Mary’s life was an exceptional experience as one felt like they were right there beside her. I can’t imagine having to live with the unnecessary loss of a baby sister, who was the victim of parental neglect. The highs and lows in Mary’s life were told in vivid detail – and yes, sometimes there was a bit of good in the mix. Highly recommended read. A great addition to any church library. This story breaks my heart. I can’t imagine having to go through some of the things this family endured. It made me stop and take notice of how blessed I really am. I’m thankful Mary had her grandparents and others to help her know of God’s love. I hope her story inspires others to make changes and keep the faith needed to improve their lives. I would like to thank Mary Perez for inviting me into her life via this Goodreads win....she told the difficult story of her life with humor and grace, always giving credit to God. She was able to forgive the people in her life who did her wrong. I admire her devotion to God and also that she never comes across as preachy in telling her story. Bravo Mary, I'm SO glad you found happiness!! An honest and authentic glimpse into the author's journey of transformation, Running in Heels was gripping from the very beginning. I had to constantly remind myself that I was reading a true story. Mary's story is one of discovery and forgiveness that gave me a new appreciation for my own family. 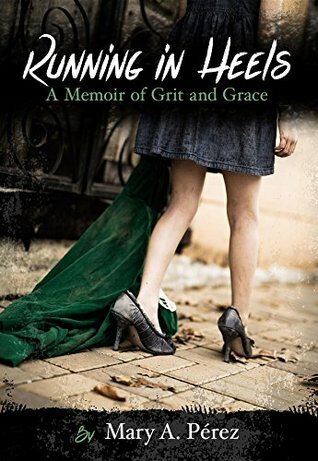 In Running in Heels: A Memoir of Grit and Grace Mary A. Peréz tells her life story - a Puerto Rican girl who experiences severe poverty as a niña, teenage marriage and subsequent divorcio, single parenthood with cuatro niños, and a second marriage in which the fin proves to be satisfying. But, it's not just the story line that makes this book alluring, it's the way the story is told. Every word is rich and carefully selected. Every page grasps the readers' attention. Every chapter demonstrates t In Running in Heels: A Memoir of Grit and Grace Mary A. Peréz tells her life story - a Puerto Rican girl who experiences severe poverty as a niña, teenage marriage and subsequent divorcio, single parenthood with cuatro niños, and a second marriage in which the fin proves to be satisfying. But, it's not just the story line that makes this book alluring, it's the way the story is told. Every word is rich and carefully selected. Every page grasps the readers' attention. Every chapter demonstrates the fine art of writing. The dialogue, the letters, and the descriptions evoke imagery. Indeed this book reads like a movie. And, without being preachy in the slightest bit, Mary A. Peréz shows how God-given principles shape her decisions. For instance, she writes: "My kids happily camped out in their backyard in a tent under a full moon. Out of respect for Mark's Jehovah's Witness family, I slept on their couch while Mark spread out nearby on the floor." Anyone can benefit by obtaining and reading a copy of Running in Heels: A Memoir of Grit and Grace. I highly recommend it. For all of us who have been there in one way or another, when we start our lives without a solid basis to learn what we are made of, Mary has come out scarred and yet with her indomitable spirit has written a great book about fig At What Price Love? I thoroughly enjoyed reading Running in Heels and if you enjoy biography’s or have in any way have overcome obstacles, this is a must read for you too. Raised with an abusive alcoholic mother and an absent father, Mary learns nothing from her parent's mistakes and chooses her own path to pain and heartache as she searches for a way to ease the hurt of a broken home. But Mary isn’t one to give up. Pugnacious and resilient are words that come to mind when thinking of this Raised with an abusive alcoholic mother and an absent father, Mary learns nothing from her parent's mistakes and chooses her own path to pain and heartache as she searches for a way to ease the hurt of a broken home. But Mary isn’t one to give up. Pugnacious and resilient are words that come to mind when thinking of this girl. I laughed, cheered, and ached, as we walked through the sights, sounds, and smells, of the eighties. If you love memoirs, I think you will enjoy reading Mary’s story of loss and pain, hope and healing, and finally, peace and happiness. While I normally read fiction, this book kept my attention and kept me reading. Some people's life stories amaze me. I was born into a Christian home to loving parents; I dated one boy and then married him. My life hasn't been one struggle after another, but that's exactly what Mary's was. As a little, uncared for girl, she watched her mother make one bad decision after another. While Mary vowed to not live the same, she too, made many bad choices. She did have one saving grace and that was her g While I normally read fiction, this book kept my attention and kept me reading. Some people's life stories amaze me. I was born into a Christian home to loving parents; I dated one boy and then married him. My life hasn't been one struggle after another, but that's exactly what Mary's was. As a little, uncared for girl, she watched her mother make one bad decision after another. While Mary vowed to not live the same, she too, made many bad choices. She did have one saving grace and that was her grandparents. Even though she only lived with them a short time, they were an anchor for her. Born in the Bronx, raised in Miami, relocated to Houston – Mary is of Puerto Rican descent, a mother to four grown children, “Mimi” to a couple of gorgeous grandchildren, and happily married (the second time around) to a phenomenal man for twenty-five years. Mary A. Pérez is the author of "Running in Heels: A Memoir of Grit and Grace", her debut memoir of the turbulent and uncertain childhood she s Born in the Bronx, raised in Miami, relocated to Houston – Mary is of Puerto Rican descent, a mother to four grown children, “Mimi” to a couple of gorgeous grandchildren, and happily married (the second time around) to a phenomenal man for twenty-five years. A Puerto Rican girl seeking love and security becomes a bride to a ruthless man twice her age. She has her first child at seventeen and her fourth at twenty-two. Can she survive obstacles thrown at her while hope is shattered time after time?